I'm reading this book for the second time. 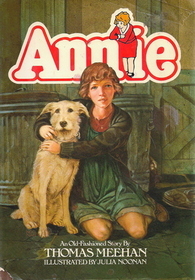 Annie is a little girl who is left in an orphanage after her parents die. A rich man asks her around for Christmas, but he only does this to make himself look good and she runs away. A lady finds her but uses her as a slave so she runs away again. While she is hiding she finds a dog. The police are looking for her and find her and send her dog to the pound. Mrs Hannigan who looks after Annie at the orphanage doesn't want her to go because she is paid to look after her. Mrs Hannigan's brother and his girlfriend pretend to be her parents so they can claim $50,000. Rated: 5/5 - "I'm giving it this score even though some bits are boring." It's about some orphans, the Baudelaire children Violet, Klaus and Sunny and they are tobogganing and fall out. Count Orloff is the evil guy who is after them. The Baudelaire children and Count Orloff are also looking for a particular sugar bowl as it has something in there that they all want and need. Rated: 4/5 - "because it's a good book." Catherine of Aragon - this book is about the first few years of her marriage to King Henry 8th. Anne Boleyn and me - this is when Catherine and Henry divorce. Elizabeth - written in the first person and is about her life when she was still a princess. Bloody Tower - Mary the 1st executed lots of people and burned people at the stake because she wanted everyone to be Catholic. 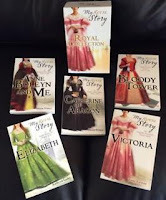 Victoria - it's the 1800's and about Victoria when she was a teenager. Rated: 10/5 - "Good for those who delight in history and want to know about the kings and queens of the past." This book is about a boy (Hugo) who lives in a train station by himself after his father dies in a fire. He has to hide otherwise he'll be sent to an orphanage. Hugo's favourite thing to do is fix clocks. He's caught stealing from a toy shop because he needs parts for his 'big machine toy thing' (called an autonomon). He meets a girl with a necklace and key which he thinks is the last piece he needs for his toy. They become friends and he discovers that her godfather owns the toy shop. At her godparents house he finds a box and the godfather walks in ... I won't tell you what happens next you'll have to read the book! Rated: 5 out of 5 clocks - "It was nice!" My friend recommended this book. It's an old book (first published in 1970). Margaret Simon is almost 12 and she moves from New York to New Jersey. At first she doesn't like New Jersey. Then she makes friends with Nancy at school and is invited into her secret club. Margaret can't wait to grow up. Margaret also has to decide whether she is Christian or Jewish because her mum is Catholic and dad is Jewish. It has some awkward moments - for example with boys. I would recommend it for 11 and older - when you reach my age you'll understand why. Rated: 5/5 - "the book explains reality really well and what happens in real life and it's a really good story."